An interactive work of functional art, this kinetic clock works entirely by gravity. An interactive work of functional art, this kinetic clock by Seth & Kali Keaveny works entirely by gravity—and a little push from you. Handmade from Baltic birch plywood and cork, this clean lined design creates a modern focal point when standing still, and a hypnotic pendulum effect when pushed. Choose from tabletop or wall-hung models. Handmade in Atlanta, Georgia. Read a Q&A with the Keaveneys. .Requires 2 AA Batteries, not included. This is an addition to my professional office and am looking forward to the positive comments. 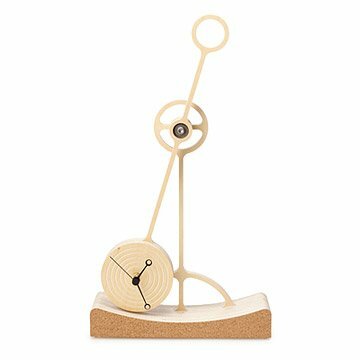 It is a very appealing, eye-catching clock that is such a unique design and balanced beautifully. The only thing that would make it beyond perfect would be if the pendulum would swing independently on its own power. That would be cool! Beautiful and unique gift for my sister who just moved to Denver and started an executive job. It's a sick clock and I might keep it for myself; haven't decided yet. Very cool design. Unfortunately, the mechanism does not swing on its own. Instead, it swings for a few seconds if you lift it to one side. It requires one AA battery, not two as the website indicates. I kept looking for the compartment for the second battery. I thought maybe that's what propelled the pendulum. Time flies while having fun watching this clock! Clock hands flimsy and arrived slightly bent, but not enough to affect function. Wonderful piece to watch. Mesmerizing. The only thing that could have been better would be if the pendulum swung on its own continuously. Other than than we liked it. Your information needs to specify that it has no motor, so it's a pendulum for a maximum of 2 minutes. Unbelievably unique and dripping with style! I absolutely love this clock!! It was totally as advertised. The craftsmanship is obviously top notch and the quality is above reproach. The swinging action is so cool. It's quite the attention grabber, everyone who has seen it comments and asks where I got it! Gave it to my dad for his office. Very sharp! !